The show begins at 7:30, with doors opening a half hour before the show. Join us for an evening of creative, irreverent fun! A: "A collective endeavor which engages in rhythmic typewriter manipulation combined with elements of performance, comedy and satire." More from their website: BTO aims to entertain the masses while providing an outlet for the creative urges of its members. *BTO promises to protect customer confidentiality with the utmost vigilance while remaining irreverent at all times. 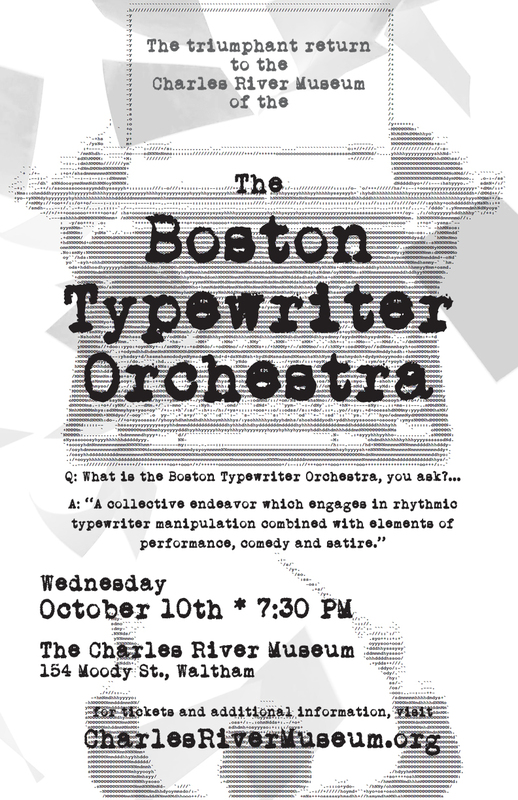 This is your chance to come and see and hear typewriters make music! - For those of you who've enjoyed a concert in our Main Gallery before, just imagine what the Boston Typewriter Orchestra is going to sound like in that amazing space! For those 21+, your first bevereage (beer or wine) is included in the ticket price. Complimentary non-alcoholic beverages for all.